It’s tough being a mum at Christmas. 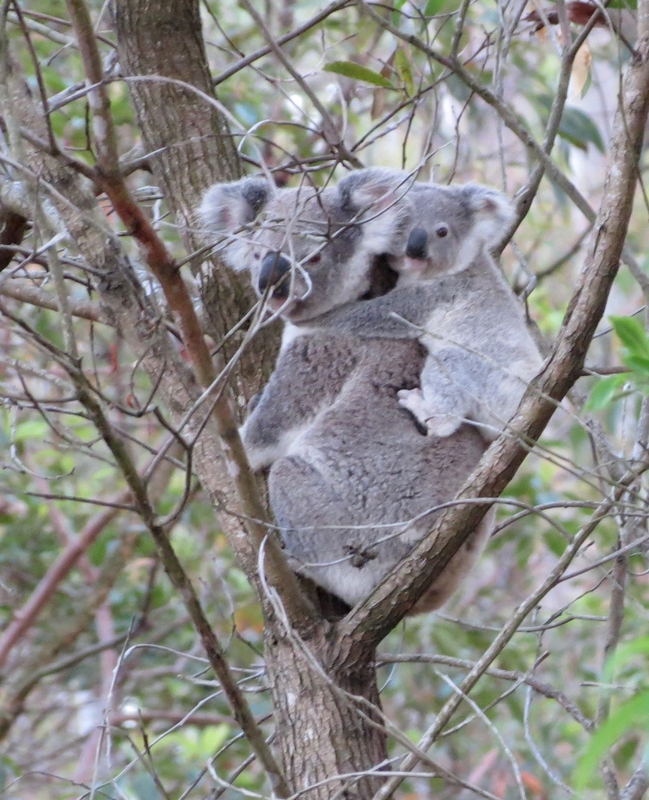 Thanks to our Koala spotters I have more photos of our cute neighbours to share. 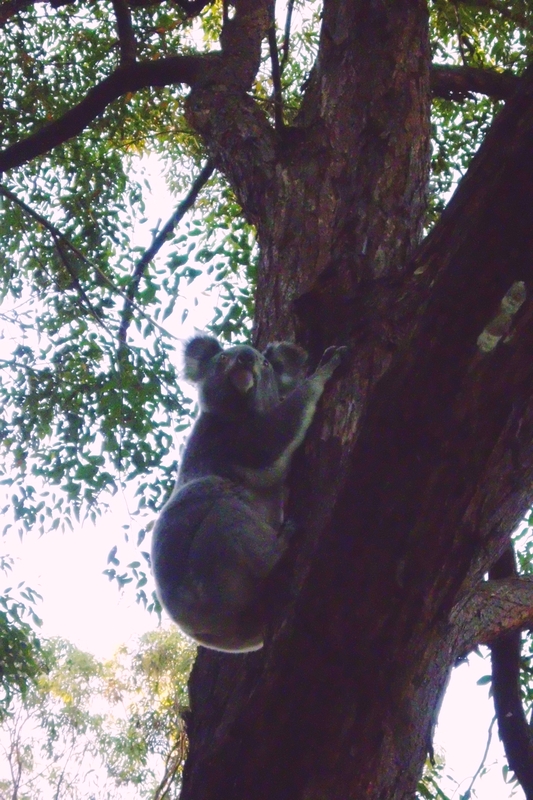 Jason and Tash are always happy when they have Koalas visiting their Fox Gully property. So they were very pleased when this poor long suffering mum and her joey posed for their American visitors. 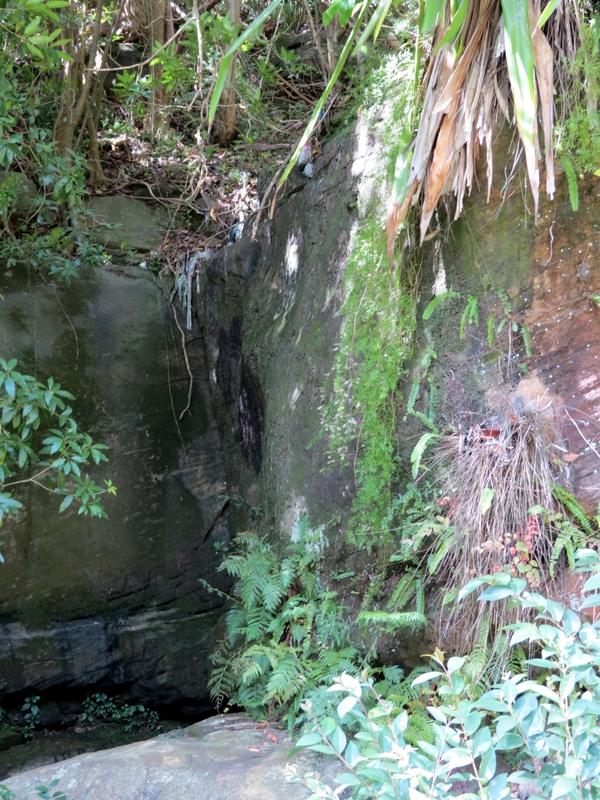 Toni was really proud when she photographed three Koalas in one tree in Firefly Gully. 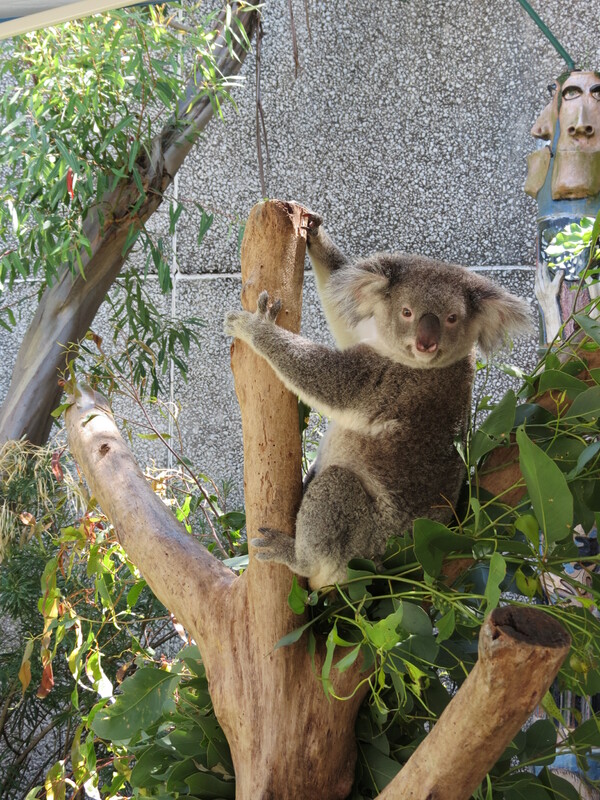 Thanks to Michelle for this photo of a Koala posing for visitors at Mt Gravatt Lookout. On the way back down the mountain Michaelle spotted another Koala. Not a bad start to 2019. 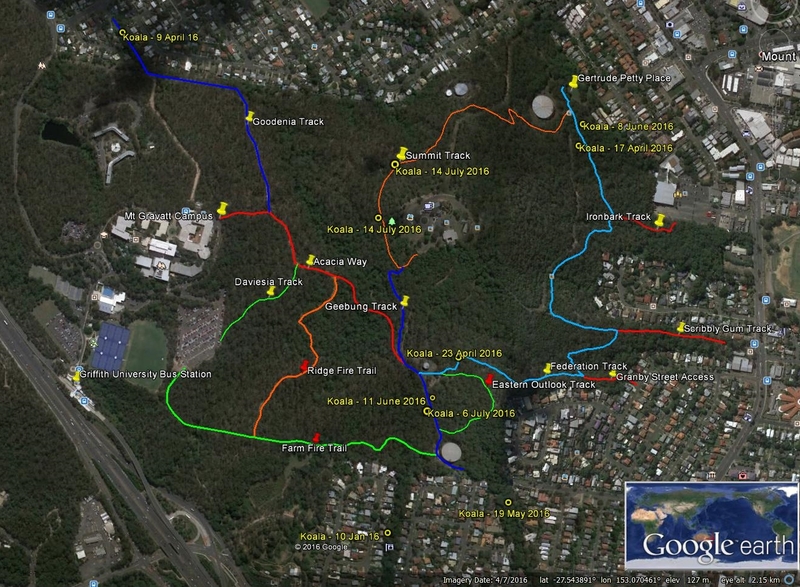 Dogs are allowed in Mt Gravatt Conservation Reserve but please keep them on a leash as Koalas are currently breeding. 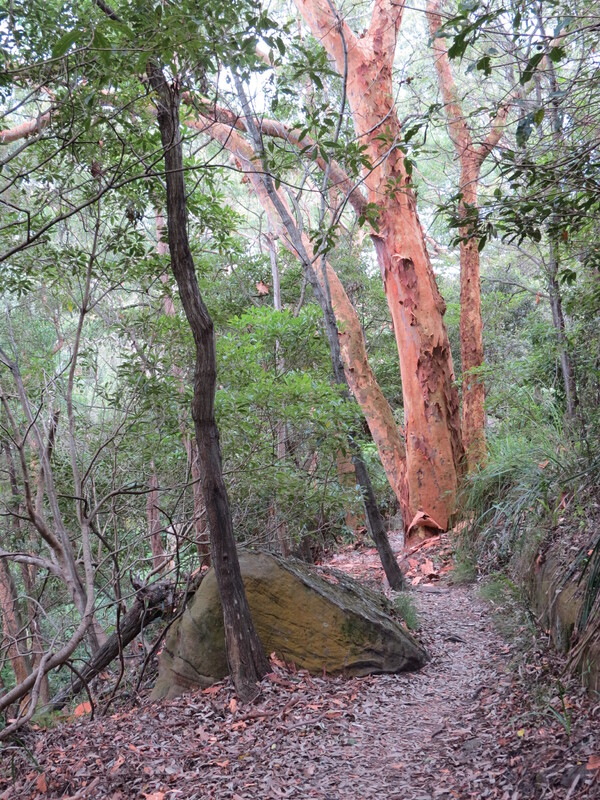 “Walking on the mountain yesterday around 10.30 proved exciting: two Koalas on the Summit Track. 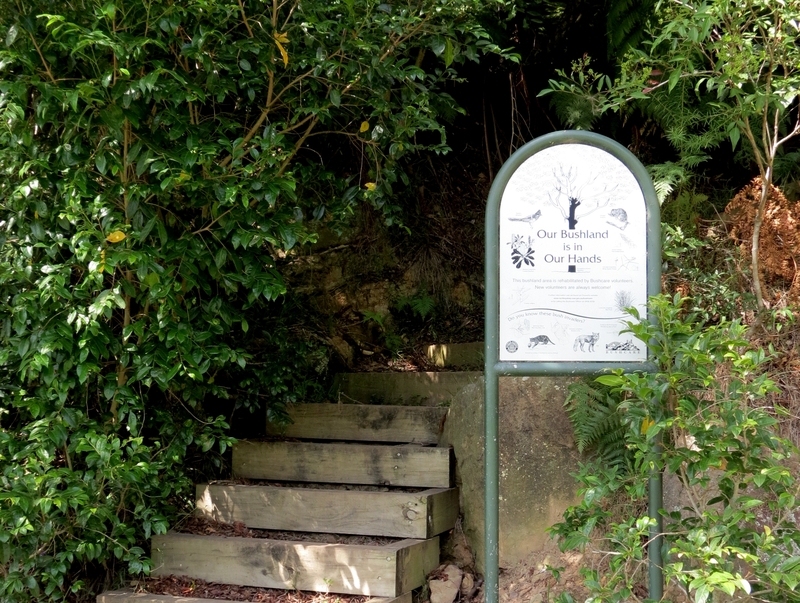 The first was sitting in a fork directly above the 5th guided walk sign-post. 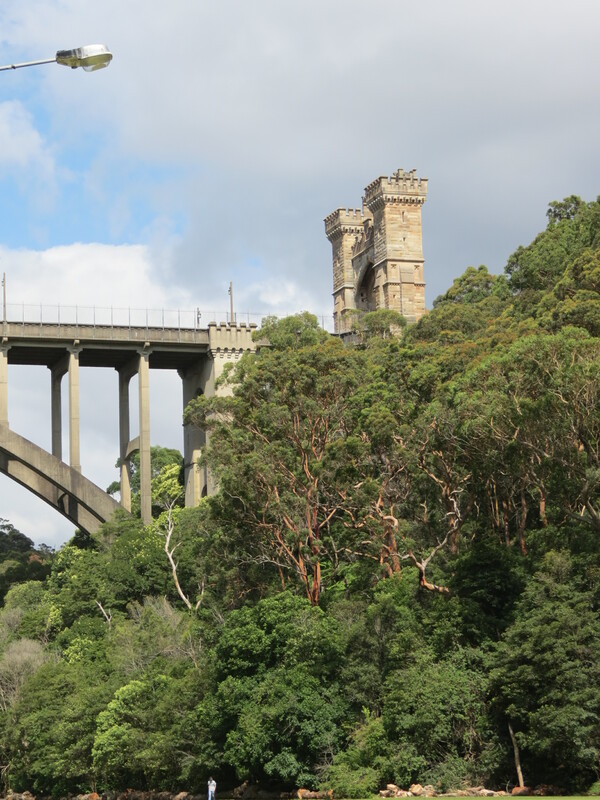 The second had actually climbed down from a tree, walked along the track before climbing back up a tree about four steps from the top of the flight up the western side of the mountain on the Summit Track, where it promptly started feeding. 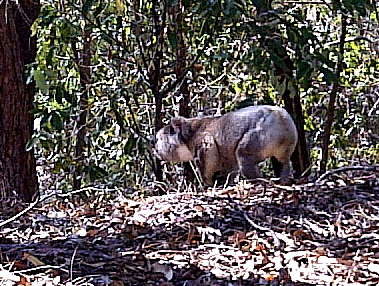 Two in one day really proves we have at least two koalas on the mountain! We think the ones we saw were both young. 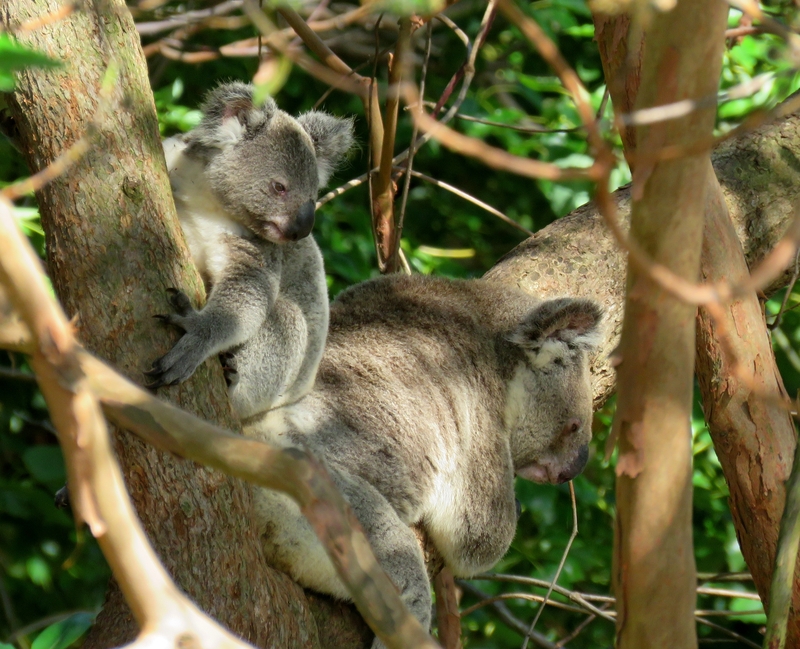 BCC information on Dogs and Koalas: identifies that Koalas are under threat of extinction. Koalas are now listed as vulnerable in Queensland under the Australian Environment Protection and Biodiversity Conservation Act 1999 and also in the South East Queensland bio-region under the Queensland Nature Conservation Act 1992. 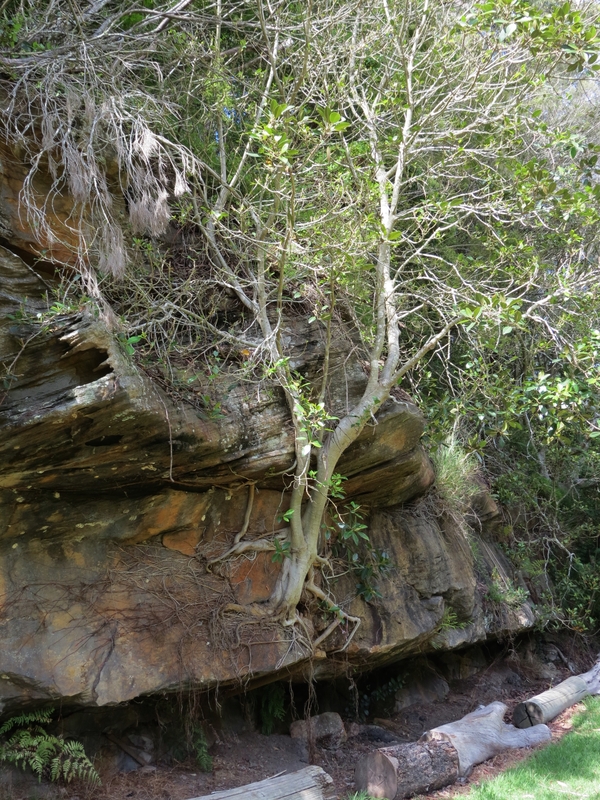 Queensland was once home to millions of Koalas. However, the BCC estimates that now there may be as few as 100,000 left in existence statewide. Koalas were still being hunted in Queensland in the 1920s, since that time habitat clearing and road trauma have been the have been the most significant threat with dog attacks number three. 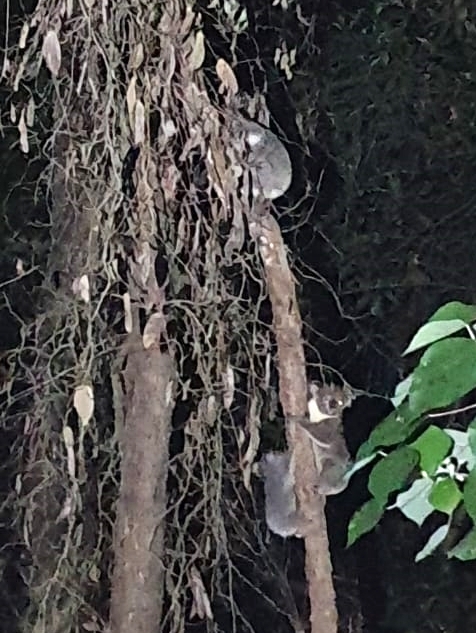 Koalas are now breeding in Mt Gravatt Conservation Reserve so we have a second chance to keep this unique and iconic species as part of our community. 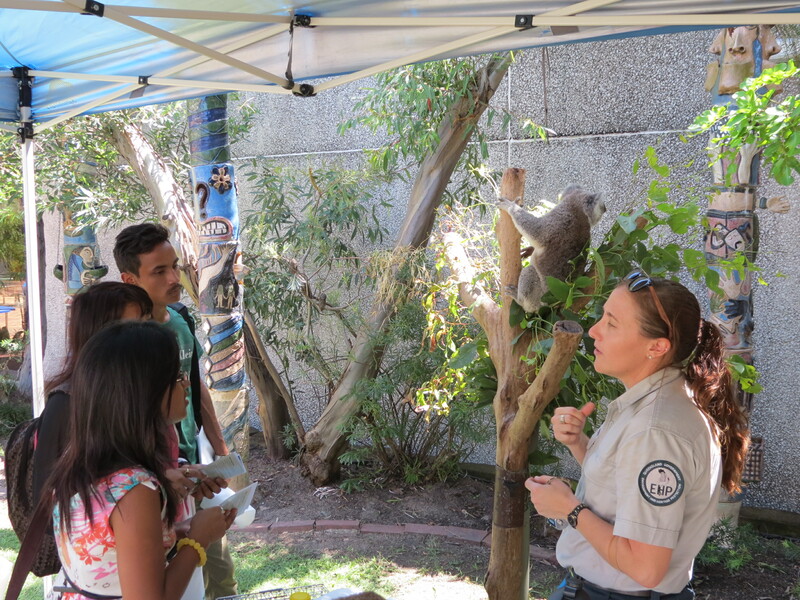 Koalas live here – dogs visit Keep your dog on leash while walking in the Reserve and help us protect and grow the Koala population. Your dog wants to play off-leash? 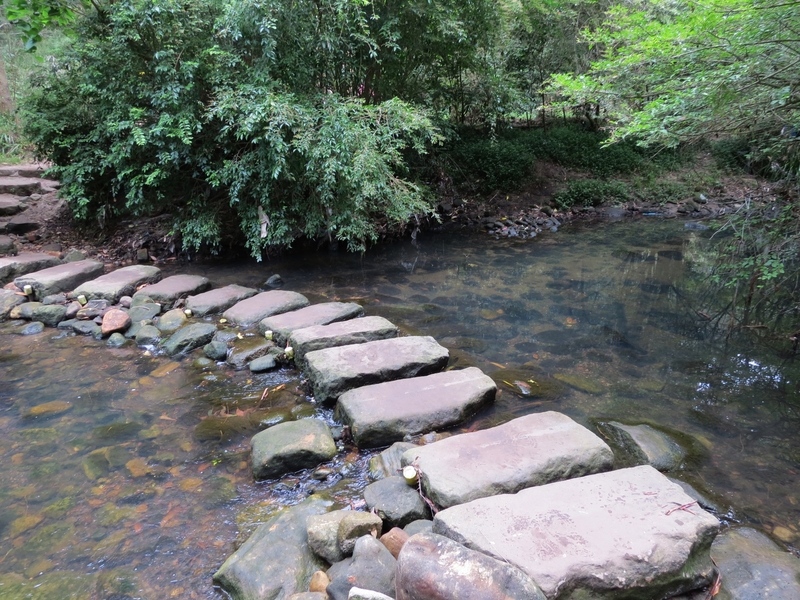 Visit Abbeville Street Park. Koala Phascolarctos cinereus breeding season is roughly August to February. 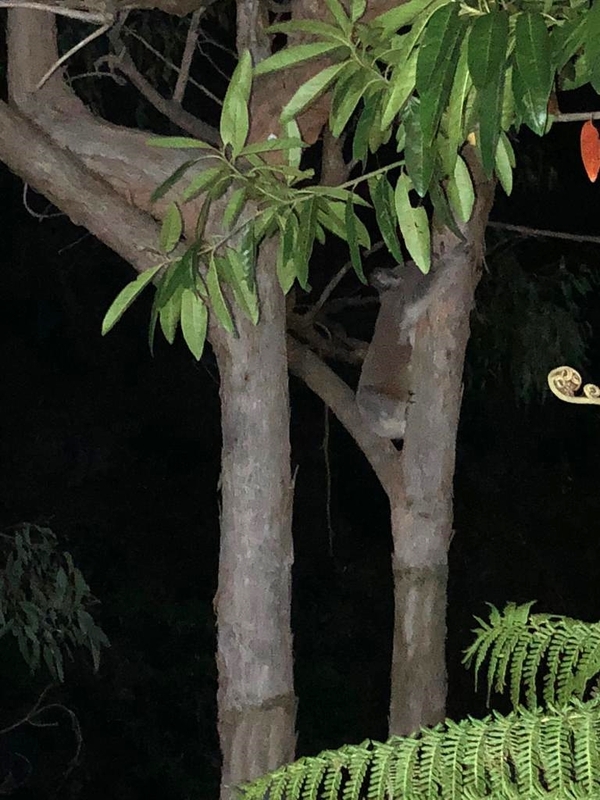 For some weeks we have been listening to the fighting, bellowing, screaming at night and this morning a Koala mum and baby was sitting in an Acacia just beside the Farm Fire Trail. 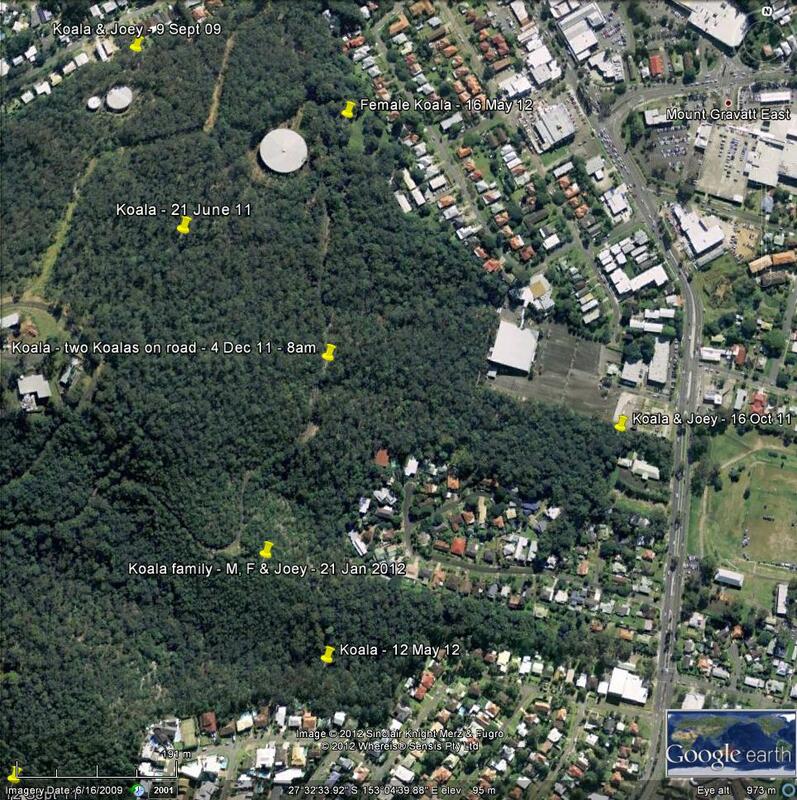 Koalas are returning to Mt Gravatt Conservation Reserve. 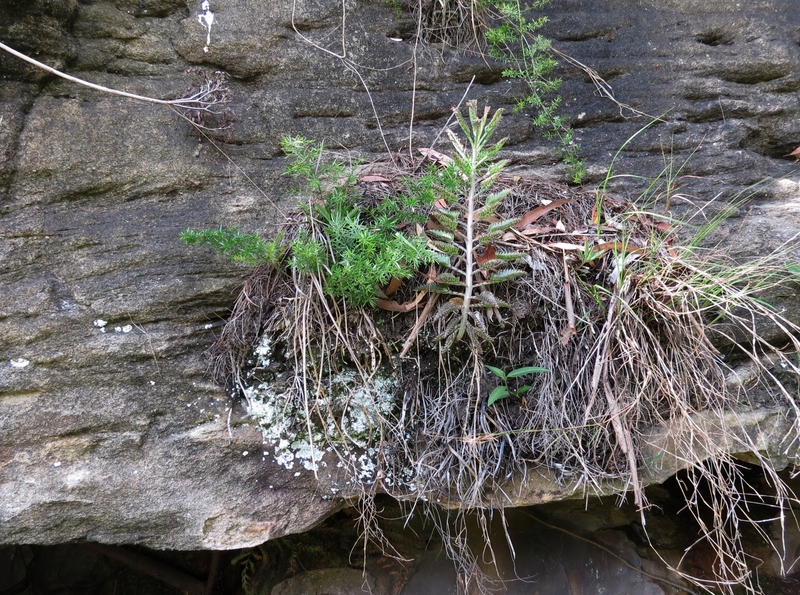 An extraordinary example of the resilience of nature if we give it a chance. As recently as August 1927 over 500,000 Queensland Koalas were hunted for their pelts. 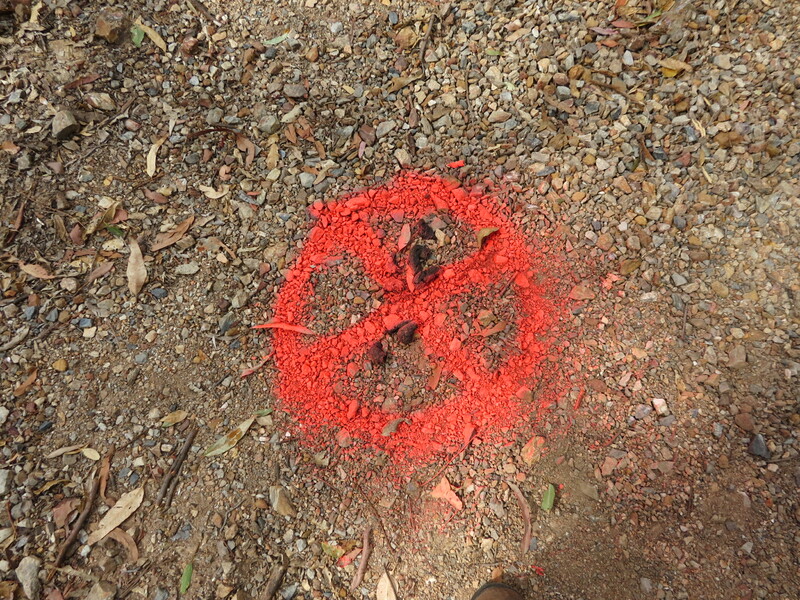 Hunting is no longer a threat however in our urban environment dogs are a threat to the returning Koalas. A quick bite, even from a small dog, can kill through infection or shock. My dog would only play with it. Even a quick bite is enough to kill a Koala. A Koala’s skin is very pliable, with little fat for protection, and internal organs are easily punctured. Some Koalas may appear to have survived a dog attack with very few visible signs of external trauma but may be suffering from internal injuries and may die later from shock or infection. Stress alone might also be enough to trigger other problems such as disease. During breeding season it is particularly important to keep dogs on a leash within the Reserve and pick up after your dog. This afternoon about 4pm we stopped clearing weeds and sat down at Gertrude Petty Place for a cool drink and something to eat. To my amazement, a female koala jumped to the ground from a sapling gum a few metres away and headed out onto the grass. 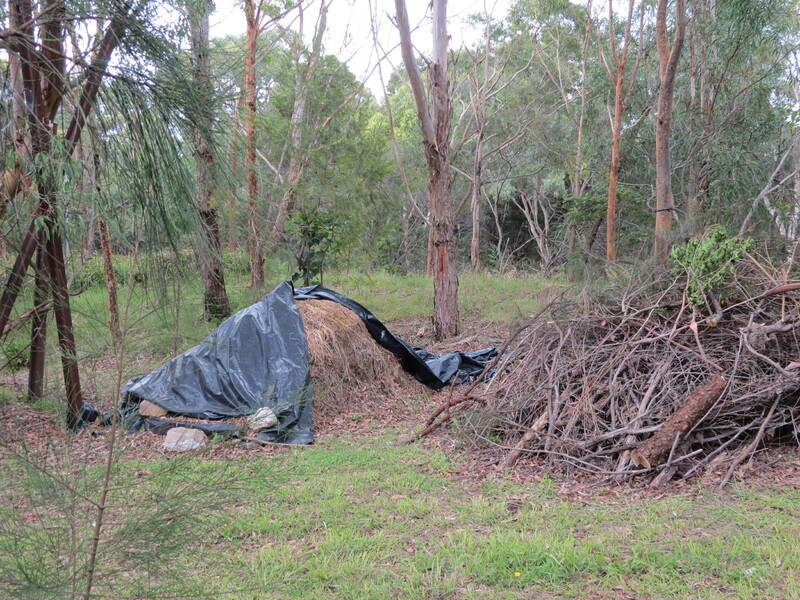 I squatted with the camera to take a shot, not realising that the Tallowwood gum I was hiding behind was the koala’s next destination! It shot up the Tallowwood, only stopping once to look back disdainfully at me. 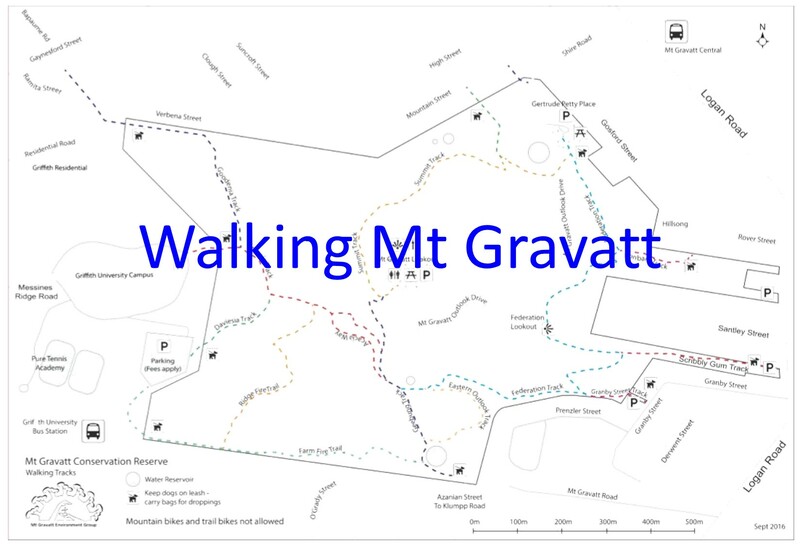 People sometimes forget that Mt Gravatt Conservation Reserve is an enviromental park where visitors share the habitat with koalas, echidnas and many other species. 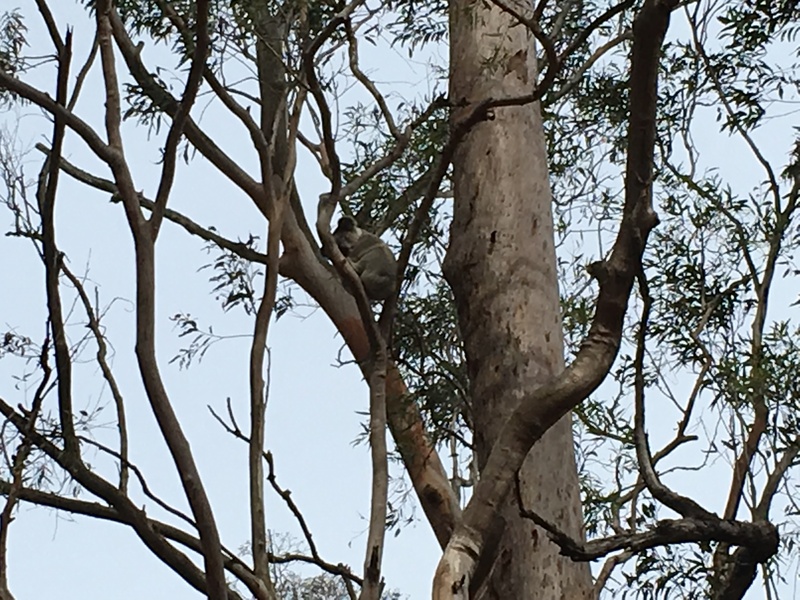 It is wonderful to see people enjoying the Summit and Federation Outlook tracks, particularly with the increasing sightings of koalas. 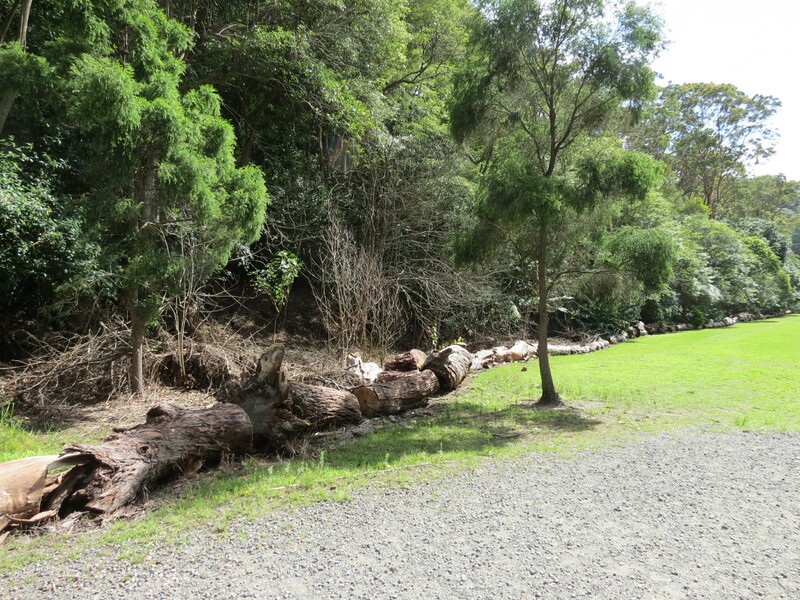 However, many people parking at Gertrude Petty Place then go walking dogs off-leash in our conservation reserve. 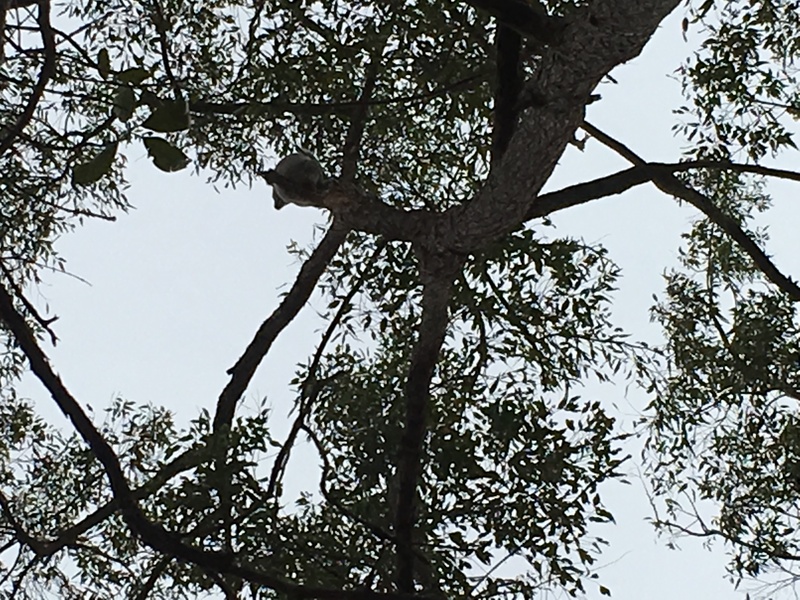 The presence of this koala at Gertrude Petty Place today, is a very good reason why we should be encouraging dog owners to keep their animals on-leash in the Reserve.